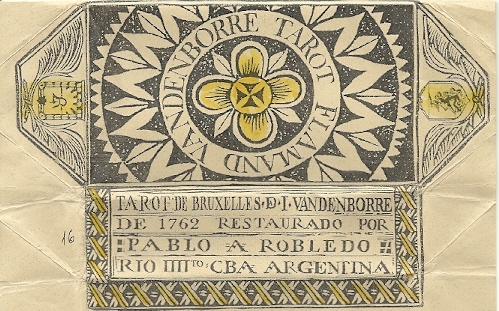 I am very excited about this fresh new version of the 1762 Vandenborre deck published this month by the Argentinian tarot maker Pablo Robledo. 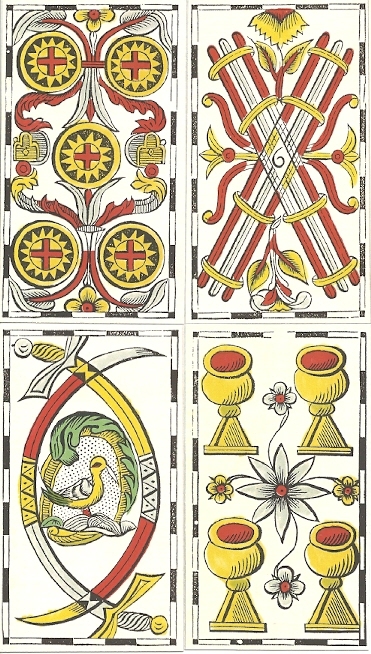 This Brussels-Rouen pattern deck is first cousin to the Tarot de Marseille. Some of its unique imagery may stem from a lost tradition that migrated from Ferrara to France and Belgium. Its most notable feature is the substitution of the Spanish Captain and Bacchus for the Papesse and Pope. Read a lot more information about this deck and the Captain in another blog article here. Until now, the only available version was printed by Carta Mundi in 1983 and distributed by US Games. I’ve always been very happy to have a copy of this historically unique deck to refer to. But Robledo’s deck is so beautiful and so pleasant to handle that I may actually start reading with it! Shown here is a side-by-side comparison of Le Bateleur in the two decks. Robledo’s deck is a bit smaller (2.5 by a little less than 4.5 inches). The background is slightly off-white so there’s no harsh glare. The lines are faithfully reproduced from the original, but the colors are subtly updated, making the cards much easier to read. I love the pips in this deck. They are large, sturdy, and have a strong presence. It’s going to be interesting to find out how they speak when I start reading with this deck. The medium weight card stock is smooth, silky and pleasant to touch. Instead of a box, the deck comes wrapped in a sturdy envelope with a unique block printed design created by Robledo in the 18th-century tradition. A card is included with publication information that’s dated and initialed by Robledo. As far as I know the only way you can get this very limited edition deck, aside from contacting Robledo himself, is to e-mail info@collectarot.com (located in the US). The Game of Hope site also has a version for sale. The Game of Hope site offers a much smaller size, Bridge I believe. The colors will be identical to the Carta Mundi edition. This new reissue from Robledo appears to be a drastic color overhaul, and it looks amazing! Thanks for mentioning this version – I just purchased it. The colors seem deeper and richer than Robledo’s, and I think I’ll feel comfortable taking it to a coffee shop and shuffling it among the blueberry muffin crumbs. Which I wouldn’t dream of doing with most of my historic reproduction decks. I’m on the wait list. Alas, such is life!